The Almas (Mongolian: Алмас/Almas, Bulgarian: Алмас, Chechen: Алмазы, Turkish: Albıs), Mongolian for "wild man", is a purported hominid cryptozoological species reputed to inhabit the Caucasus and Pamir Mountains of central Asia, and the Altai Mountains of southern Mongolia. Other names by which these creatures are known, depending on the particular region, are 'Wind-Man', Abnuaaya, Bekk-Bok, Biabin-Guli, Gul-Biavan, Guli-Avan, Golub-Yavan, Kaptar, Kra-Dhan, Ksy-Giik or Ksy Gyik, Mirygdy, Mulen and Voita. 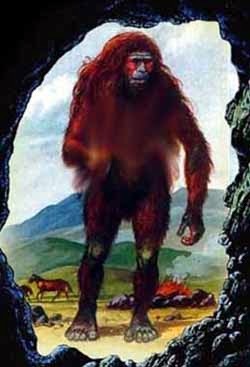 Almases are typically described as human-like bipedal animals, between five and six and a half feet tall, their bodies covered with reddish-brown hair, with anthropomorphic facial features including a pronounced browridge, flat nose, and a receding chin. Many cryptozoologists believe there is a similarity between these descriptions and modern reconstructions of how Neanderthals might have appeared. "In the mountains themselves live a wild people, who have nothing in common with other human beings, a pelt covers the entire body of these creatures. Only the hands and face are free of hair. They run around in the hills like animals and eat foliage and grass and whatever else they can find. The Lord of the Territory made Egidi a present of a couple of forest people, a man and a woman, together with three untamed horses the sizes of asses and all sorts of other animals which are not found in German lands and which I cannot therefore put a name to." 1807-1867 - Sightings reported at Khalkha, the Galbin Gobi and Dzakh Soudjin Gobi as well as in Inner Mongolia; also at the Gourban Bogdin Gobi, Chardzyn Gobi and the Alachan desert. In the mid 1800s a wild woman who was named Zana is said to have lived in the isolated mountain village of T'khina fifty miles from Sukhumi in Abkhazia in the Caucasus; some have speculated she may have been an Almas. According to accounts, she was very physically powerful, able to perform feats of exceptional strength. Zana, at first was violent towards her captors but soon became domesticated and assisted with simple household chores. While in captivity, Zana was passed on through a succession of owners and mothered several hybrid children. According to the story, she had as many as 6 offspring, by different men, with a total of 4 surviving with the help of the local village women. According to reports the children were fairly normal, except for being dark and physically powerful. The 4 children were assimilated into normal society, married, and had families of their own One of the male children, Khwit, remains namely the skull was examined by Dr. Grover Krantz in the early 1990s. He pronounced it to be entirely modern, with no Neanderthal features at all. Zana, herself died sometime in the 1890. In the 2013 a documentary, Bigfoot Files, Professor Bryan Sykes of the University of Oxford showed that Zana's DNA was 100% Sub-Saharan African in origin and she could have been a slave brought to Abkhazia by the Ottoman Empire Prof. Sykes did however raise questions as to whether Zana could have been from a population of Africans who left the continent tens of thousands of years earlier as her son, Khwit's skull had some very unique and archaic characteristics. There is much more to the tale of Zana and her offspring, I invite others to research and come to their own conclusions. Myra Shackley and Bernard Heuvelmans have speculated that the Almases are a relict population of Neanderthals, while Loren Coleman suggests surviving specimens of Homo erectus. They have been connected to the Denisova hominin. Descriptions of Almases are similar to that of the Yeti of the Himalayas. Most of this information comes from Wikipedia and there is very little I have added to the post. As for the photo used, I do not know who the original artist is or who to give credit to. There is much more tales of the Almas and sighting reports than I have included here.